Balsamic roasted Brussels sprouts is the perfect side dish for your festive meals; it is quick and easy with minimal prep work and feeds a crowd! 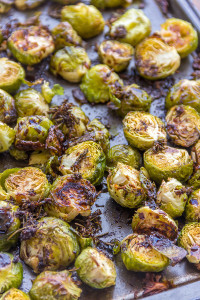 Holiday season is just around the corner and there could have been no better time than this to share my balsamic roasted Brussels sprouts recipe! Okay, don’t get started if you are not a Brussels sprouts lover; there do exist people who love Brussels sprouts just like me! I am not kidding you guys, I really like roasted Brussels sprouts. The charred nutty flavor of Brussels after being roasted is simply addictive and pairs perfectly with a spicy roast chicken! Roast chicken being the cult favorite holiday dish, there has to be an equally appetizing side, isn’t it? Trust me on this, Brussels sprouts really tastes great when prepared with right flavors. The sweetness of balsamic vinegar enhances the natural sweetness of Brussels sprouts giving it a tantalizing sweet-savory scrumptiousness. 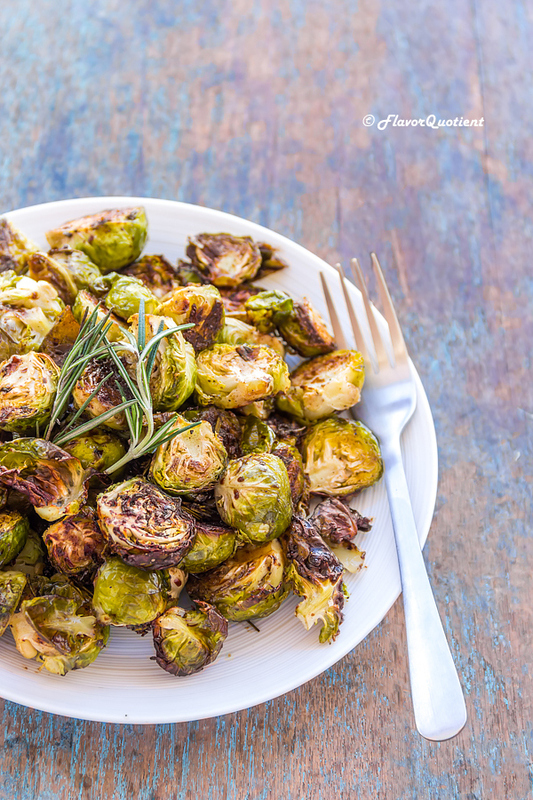 There can only be 2 types of relationship with Brussels sprouts – either you love it or you hate it! There is no middle way and I belong to the first category. Otherwise this Brussels sprouts recipe wouldn’t have appeared here! Even though Brussels sprouts are produced in many parts of India, it is still not too popular with us Indians. When I first discovered Brussels sprouts in a supermarket, I remember exclaiming like a kid – how come a cabbage can be so tiny!! I am sure we all have had this moment of surprise upon seeing these cute little Brussels sprouts for the first time ever! Haven’t you? Let me know in comments below! I made this balsamic roasted Brussels sprouts as a side for my whole roast chicken which is just coming up next in the blog to make your holiday dinners hundred percent fail-proof. I am usually a roast-chicken-and-potato person, but this time I decided to amp-up the side dish a little and hence replaced the roasted potatoes with roasted Brussels sprouts. And I don’t regret it! Yes, potatoes are still my cult-favorite but we all need some variety in life too, right? But if you still want to stick to your potatoes, I have guarded you there too! Check out Flavor Quotient’s all-time most popular Indian spiced roasted potato recipe and get even more addictive to potatoes than ever before! 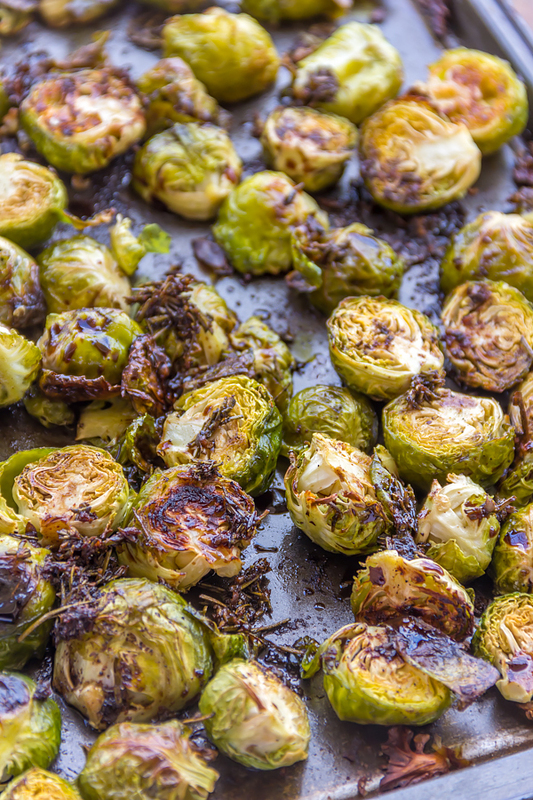 Coming back to balsamic roasted Brussels sprouts; this is quite an easy recipe. You only have to make the balsamic reduction while the sprouts are being roasted and this balsamic reduction is quite user-friendly too! I flavored my balsamic reduction with fresh rosemary, garlic and honey with a kick of paprika to balance out the sweetness. 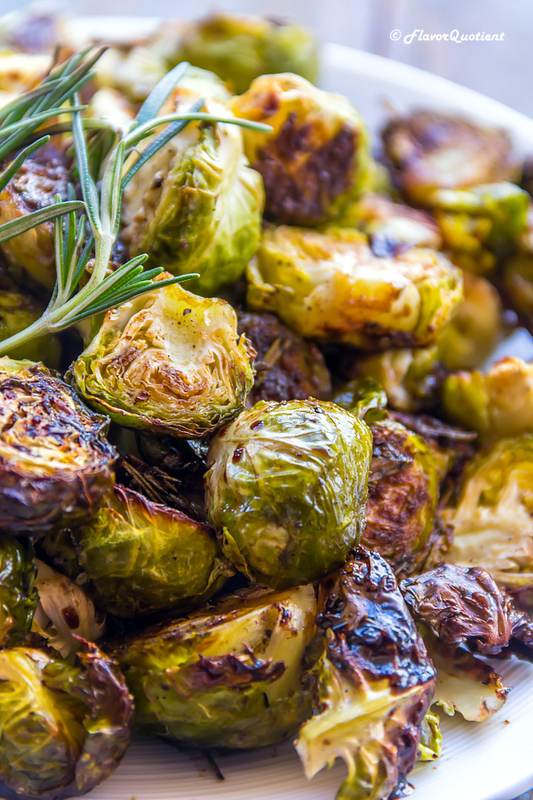 You can experiment with the flavors you love and make your own signature reduction for your roasted Brussels sprouts. If you are looking for more options for your side dishes this holiday season, do check out my roasted baby carrots and broccoli. Happy cooking! Preheat your oven to 200 C / 400 F and place the wire rack at the lowest level. Wash and pat dry the Brussels sprouts. Trim the woody stock and cut each sprout into half. Arrange the Brussels sprouts on a baking sheet. Drizzle the olive oil and season with salt & pepper. Mix well with a spatula. 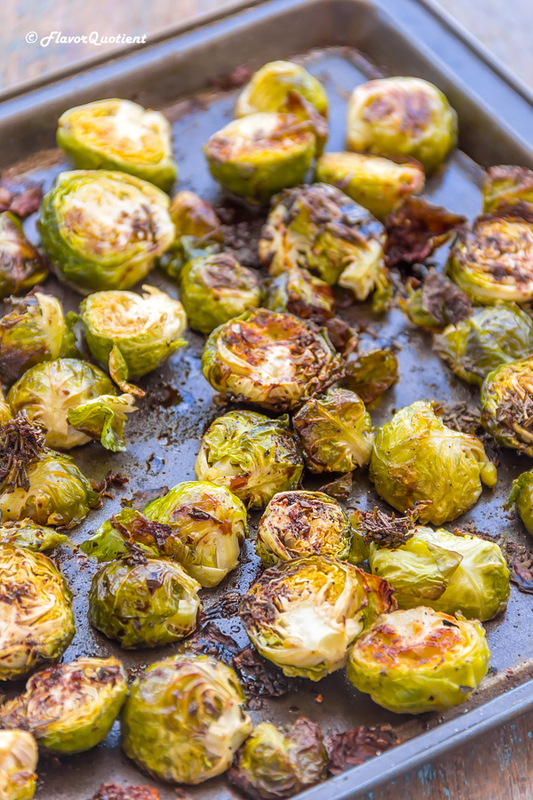 Roast the Brussels sprouts in preheated oven for 20-30 minutes or until tender and charred around the edges. Do flip them once on the midway to ensure even roasting on all sides. While the sprouts are being roasted, heat the balsamic vinegar in a small saucepan. Add honey, garlic and chopped fresh rosemary. Add paprika and mix everything thoroughly using a spatula or wire whisk. Bring the balsamic to boil, then reduce heat and continue to simmer until the vinegar thickens. This would take about 5-7 minutes. Once the balsamic reduction is thick enough to coat the sprouts, remove from heat and transfer to a bowl. Take the roasted Brussels sprouts out of the oven and drizzle the prepared balsamic reduction all over. Serve the warm balsamic roasted Brussels sprouts on the side with your favorite roast chicken. Enjoy!